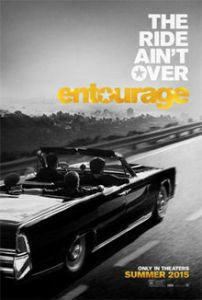 It’s been three and a half long years since we last saw what Vincent Chase and his entourage have been getting up to. Now fans are finally being rewarded for their patience with a movie to continue the events of the hit TV show. The film will follow Vince (Adrian Grenier), Eric (Kevin Connolly), Drama (Kevin Dillon), and Turtle (Jerry Ferrara) being bankrolled by Ari (Jeremy Piven) in order for Vince to try his hand at directing. Expect all of the usual cameo appearances that you would see on the show in cinemas from 12th June 2015. Tagged Action, Comedy, Preview. Bookmark the permalink.